The UN hopes to start delivering aid to Syria’s beleaguered population as soon as Saturday, a spokesman said Friday after U.S. and Russian officials announced a “cessation of hostilities” among the various factions—excluding ISIS and the al-Qaeda-linked al-Nusra Front—involved in the nearly five-year-long civil war. Early Friday, John Kerry, the U.S. secretary of state, and his Russian counterpart, Sergey Lavrov, announced in Munich that they had agreed upon the delivery of aid to besieged Syrian cities, followed by a “cessation of hostilities” starting next week. The term is more temporary than a cease-fire, Kerry said, and would constitute “a pause” in the fighting. The date agreed to in Munich is a compromise between the two powers who are on opposite sides of the Syrian civil war: The U.S., which is calling for Syrian President Bashar Assad to step down, had wanted an immediate cease-fire; Russia, which is backing Assad through military means, had offered a March 1 date. Critics of the Russian offer, however, pointed out that with Russia’s military help, Assad is in a stronger position now than at any point since the civil war began in March 2011. Indeed, in recent days, his troops, backed by Russian airstrikes, have bombarded Aleppo, a rebel-held city that is Syria’s largest. Capture of the city would further entrench Assad’s position, giving him fewer reasons to negotiate with the Syrian opposition—making the Munich agreement al the more significant. If successful, the announced compromise would mark the first time for a halt in the fighting since the civil war began in the throes of the Arab Spring. And, it is hoped, the “cessation of hostilities” will pave the way for the resumption on February 25 of UN-mediated talks in Geneva involving the various warring Syrian factions, and, eventually, to a cease-fire. 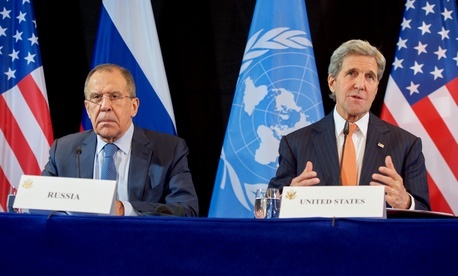 Still, Kerry, speaking after announcing the deal with Lavrov, acknowledged the difficulties that lie ahead. “What we have here are words on paper, what we need to see in the next few days are actions on the ground,” he said. Even if they do, it is unclear what impact such an agreement will have. Two of the most powerful groups fighting Assad—ISIS and al-Nusra Front—are excluded from the agreement. The groups are the two biggest draws for foreign fighters involved in the Syrian civil war. ISIS controls large parts of territory across the Syria-Iraq border; al-Nusra, meanwhile, controls parts of northwestern Syria.